What does a typical ‘roving retirement’ day look like in Barcelona? A morning stroll through La Boqueria Market for a freshly squeezed juice for around $3 sets us up nicely as we wander through the rest of the market. It’s a hive of activity with stalls setting up for the busy day ahead. 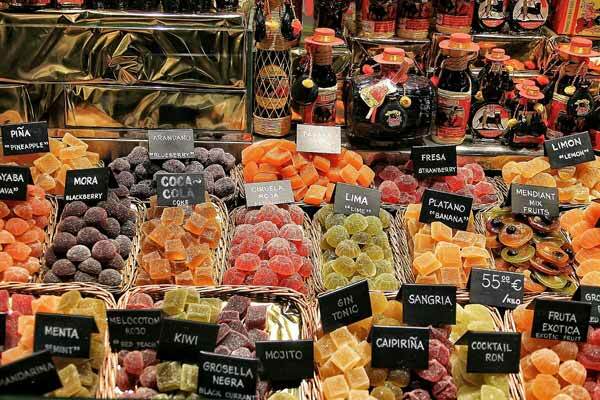 La Boqueria has been rated as one of Europe’s best markets. Every moment spent there is a sensory overload. Fishmongers with last night’s catch display their haul whilst chatting and laughing with their morning regular customers who wait patiently in line. There are cheese, wine, meat, fruit, vegetable and dried fruit stalls not to mention several tapas bars all teasing us with their savoury and sweet aromas. Coming out into the daylight we head down Las Ramblas, Barcelona’s busiest street before ducking into the cobblestoned laneways of the Gothic area. We wander past many small cafes looking for our daily fix of a strong Americano coffee and a freshly baked croissant. Many cafes have breakfast specials for around $4 to $5. Barcelona is a foodie heaven. Around every corner there is a tapas bar, a local neighbourhood market, a small café or a restaurant. You could sit in bustling square all day long in the city and just people watch. 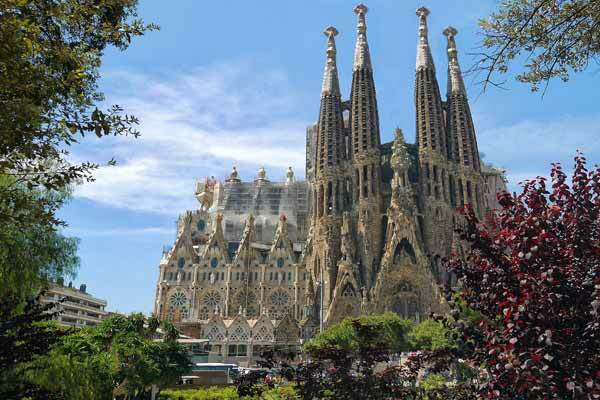 We slowly stroll through the streets towards La Sagrada Familia, Gaudi’s masterpiece, to check on the latest developments. The plan is to have it completed by 2026. 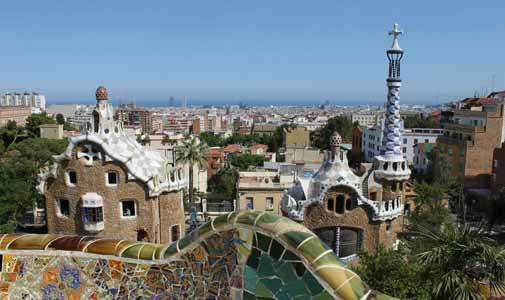 The breathtaking views over Barcelona can be seen from two of the completed towers. As usual the queue is starting to snake around into the side street. It’s best to book online for ‘skip the queue’ tickets and we highly recommend that you include a visit to one of the towers. The sun is shining as we head down to Barceloneta beach to catch some rays before lunch. It’s just 10 minutes from the Gothic area and is part of a stretch of four-and-a-half kilometres of beaches along the Spanish coastline. For picture-perfect sunsets we can recommend taking a bottle of wine or some chilled beers and some snacks and head down to the beach for an evening picnic just as the locals do. For a late lunch we head back to one of the many tapas bars in the market. How can you choose from the vast displays that line the counter tops? And if you think choosing what to eat is hard, you then need to try and choose which glass of wine to have with them. An afternoon siesta is called for before we head out in the Spanish night ready to indulge in more fine food and wine. The Spanish tend to eat a lot later than most countries we have visited on our travels. It’s hard to get our heads around eating dinner at 10 p.m. If you simply can’t wait, you will find restaurants will open earlier for tourists, but their busiest times are from 10 p.m. onwards. 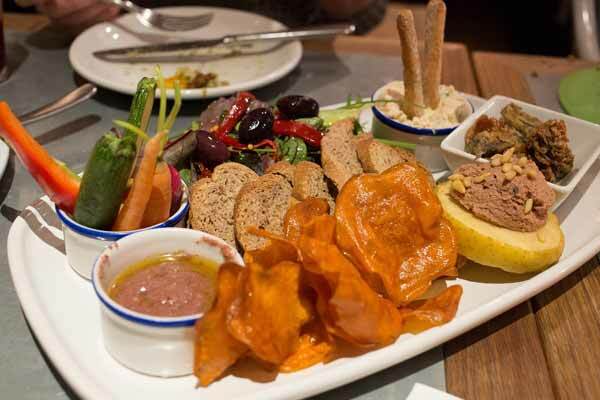 There are small tapas bars open in the early evening in most parts of the city. A special favourite of ours only offers Cava (sparkling wine) and plates of jambon (ham). It is packed inside and out as customers flock for a pre-dinner drink. When it’s time for dinner (finally!) 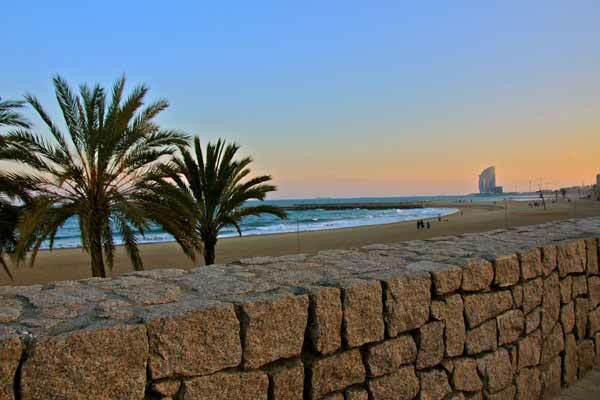 we either head down to the beach restaurants of Barceloneta or hunt for a hidden gem on one of the back streets.